Dice hammer, what?! Yes! DICE HAMMER. 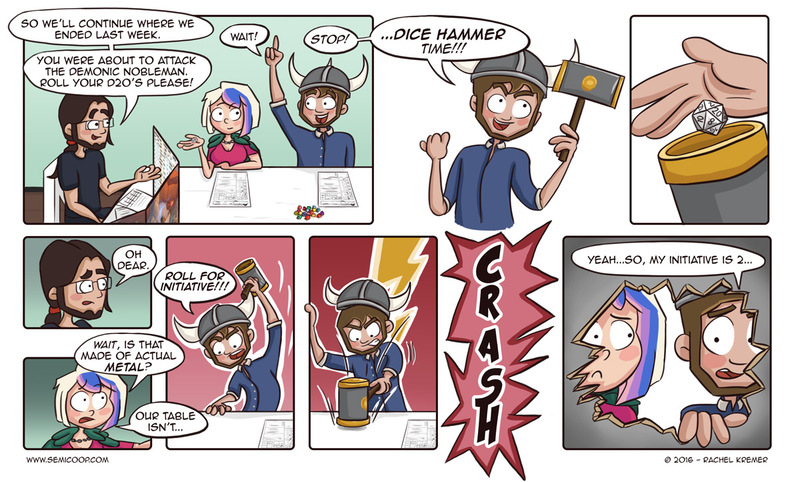 I saw this beauty on Reddit many moons ago and ever since I started Semi Co-op I wanted to make a webcomic about a dice hammer situation (gone wrong)! 😉 It’s such a ridiculous and magnificent object, at the same time. The last time we played Dungeons and Dragons has been quite a while ago as well. It must have been about six or seven years ago. We weren’t much of a serious roleplaying group and mostly enjoyed hanging around together as a group. I’m sure that our Dungeon Master was presented with quite some silly requests from our characters. “There’s a rooster behind that fence?! Can we take it with us? !” When we decided we could better end our adventures in the world of Dungeons and Dragons because we were distracted by everything our party came across, our DM wrote a horrifying last mission for us in which we all died. My character got her brains sucked out and somebody else his character turned into a tree, forever. Technically he didn’t die, I guess. But: good times! What’s your most memorable moment in a role playing game? I tend to run games and let the players do whatever they want. This meant a game that was meant to be about a group of travelling thieves instead became about a travelling cooking show who went from place to place in search of the freshest ingredients and highlighting their culinary skills. Need a chopping block with it just to negate the force. also great hammer. I once ran an adventure where the group was captured by xenophobic elves. The player characters snuck out of the palace dungeon but ran into a guard. When they were spotted by the palace gardener, the smooth-talking dragonborn paladin convinced the xenophobic gardener that they were friends from way back and socially shamed him for not remembering her. So instead of shouting the alarm, he had them over for lunch.